This weeks math poll takes us all the way back to first and second grade. Don’t worry, If you teach middle school or high school, there’s still some juicy tidbits in here. It’s great to start a poll with a fun question, something that everyone gets right or that makes us all feel good. For this poll, we start with a check-in about how students are feeling. The problem asks to “Tap the bird that best describes how you feel”. There is no right or wrong answer so students have the opportunity to express themselves. Not only does Woot Math Polls help you learn about what your students know, it also lets you learn how they feel and build a positive classroom culture… Woot! Task 2 asks students to add 68 to 35 and to show their work. Students can use the scratchpad to show their reasoning. Note how the calculator tool is not available for this task (all of the scratchpad tools can be enabled or disabled under “Scratchpad Settings” for any given task). After students submit responses, I recommend you go over a few of them. Students may be using different strategies that are worth pointing out. Regardless it is good to validate their thinking and review how the 1s, 10s, and 100s places are apparent in each step. Task 3 is quite similar to task 2 but involves subtraction. In reviewing student work, this is a great opportunity to review how you are breaking groups of 10 into 10 1s, which will help your students develop number sense beyond the algorithms necessary for getting the right answer. 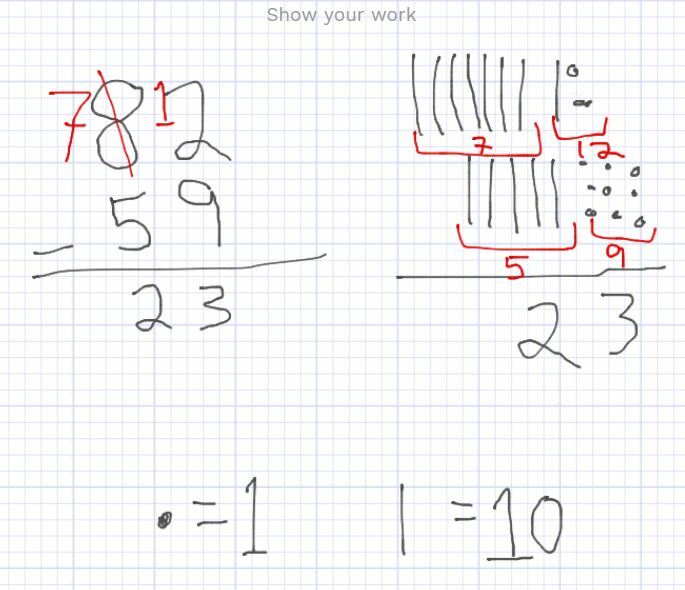 We have the following response bookmarked, called “tens and ones”, to help review that concept. Get started by previewing the poll right now, or login to wootmath.com and search for Two Digit Addition and Subtraction in the Shared Gallery.